Ever had that moment when you’re in an intense shootout in PUBG, and suddenly your back feels like it’s killing you because your chair is about as good as a chair as a rock is as a home? And then you get killed in PUBG? In case you can’t tell, that happened to me a while back and I got sick of it. So, I got rid of my half-broken office chair and decided to invest in a gaming chair, and after a bit of digging I decided to buy an EWin Champion Series gaming chair. It arrived in a pretty big box, and assembly took about 20-30 minutes. The instructions were fairly clear and used photographs as guides. And boy, was I surprised about this here chair. Although it did not increase my performance in PUBG, it’s safe to say that this chair is one hell of a chair. For starters, unlike most office chairs, it has a nice neck cushion near the top of the chair, that supports your neck in a very comfortable way. It’s also customizable as you can move the cushion up and down to fit your neck perfectly. The chair itself is made from high quality leather and is very comfortable to sit on for long periods of time. It also has a lower back cushion that is additionally customizable, so you can move it to fit your back perfectly. The chair itself is extremely comfortable to sit in, and at a price tag of $399 USD, I would say that it’s a steal considering how high quality the chair is! All in all, it’s a great chair not just for gaming, but for doing workloads that require sitting in one place for a long period of time. 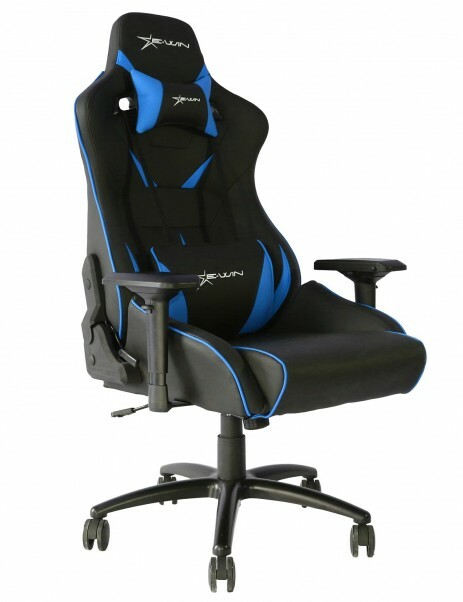 If you are interested in learning more about gaming chairs, check out their selection at https://www.ewinracing.com/. And if you purchase one, use the code CEN (from www.ConsumerElectronicsnet.com of course) and you will get 10% off!